It's from an Time Magazine issue dated July 5th, 2004. A great humorous piece on the Camino from Lydia Itoi called Steps Towards Heaven. Here's a self-published book from Josephine whom I met her in 2006 on my Camino Frances. Josephine finally completed her camino after four attempts. 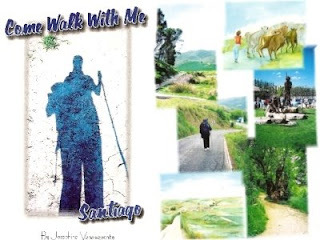 The book “COME WALK WITH ME SANTIAGO” tells the story of my 800 kilometre walk across Spain. It is a chronicle about this journey on foot under all kinds of conditions a long trek along Spain’s beautiful Northern provinces. All the information needed for a pilgrimage is found in this book. It also includes all information where to go day and night and how to live on this road .The Camino de Santiago de Compostella. Price: $ 42, -- Canadian+ shipping FOR EUROPE 35 EURO-plus shipping.